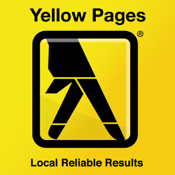 What is the Yellow Pages App for? Yellow Pages SA is a South African app which helps you connect to the best businesses in your area, fast. With our app you will have all the important contact info and tools at your fingertips, including GPS Navigation, Maps, Telephone Directory, plus much more. This is the trusted Yellow Pages book everyone knows and loves, combined with modern technology, and shrunk down to fit right into the palm of your hand. Why is the Yellow Pages SA app the best? Not only are we South Africa’s largest online database of local businesses and services, but our state-of-the-art intuitive search function allows for quicker, more accurate results. Yellow Pages also allows you to create your own unique profile where you can save custom business info. Here you can store preferred supplier lists, rate businesses and services and have access to your complete search history. So whether it’s a plumbing emergency or a need for the lowest quote, start your search with Yellow Pages - for Local Reliable Results.